Two compartment soft sided upright insulated lunchbox/cooler with Batman insignia on one side and Superman insignia on the other side. 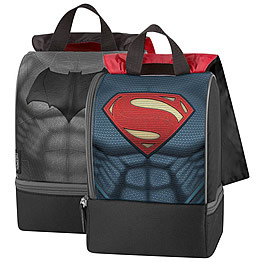 Attached nylon cape can be positioned on either side so your lunchbox can show Batman one day and Superman another day. Superman side of cape is red. Batman side of cape is black. Material carry handle on top. Two compartment design is great for separating your sandwich from your beverage. Both compartments are vinyl (PEVA) lined and insulated. Top compartment has a zipper closure on the side. Zipper between the two compartments is used to open/close the bottom compartment. BPA and PVC free. Top compartment: 7" wide x 7" high x 5" deep.